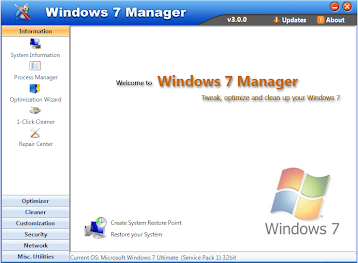 Windows 7 Manager : Windows 7 Manager is a collection of system utilities that will help you tweak, optimize and clean up your copy of Microsoft Windows 7. Windows 7 Manager will increase your system speed, improve system security, and meet all of your expectations. Windows 7 Manager is the powerful software tool to tweak and optimize your Windows 7, it bundles more than 30 different utilities in one and help your system faster and more stable, secure and personal!